At a little over 391,000 residents, New Orleans is a relatively small city—but the 9.5 million tourists who visit each year mean The Big Easy boasts the amenities, dining and cultural scene of a bustling metropolis. The result? During high tourist season (which runs from October through May), there are more events on any given day than any one person could attend. November brings a heady mix of food, football, festivals and fun. Here’s a sampling of things to do in November in New Orleans—and just remember, if you can’t get to all these events, you can always come back next year. Back and bigger than ever, the Po-boy Festival will feature live music and more than 50 varieties of po-boy. Admission is free, but you must purchase a $5 wristband to buy a sandwich. This celebration of avant-garde theater takes place in offbeat venues throughout New Orleans, including coffee houses, bars and petite playhouses. With performances ranging from dance vignettes to satiric sketch comedy, it’s a great way to get off the beaten track, both literally and artistically. Who says New Orleans doesn’t have a comedy scene? Not only does it boast comedians aplenty, the Crescent City also hosts the largest comedy festival on the Gulf Coast. Spearheaded by Chris Trew, owner of improv school and comedy venue The New Movement, Hell Yes Fest features home-grown talent as well as stars. Past headliners include Sarah Silverman and Amy Heckerling. More than a dozen varieties of gumbo (from vegan and gluten-free to Creole file, gumbo z’herbes and shrimp and oyster), brass bands, cooking demonstrations, an arts market and free parking and admission? Mais oui! You’ll find all of it in leafy, beautiful Armstrong Park during the Treme Creole Gumbo Festival. Watch Grambling and Southern University go head-to-head at the Mercedes-Benz Superdome. The only thing more heated than the rivalry is the tailgating food. Don’t miss halftime, when the school’s respective marching bands face off. It just might be a greater spectacle than the Superbowl’s halftime show. 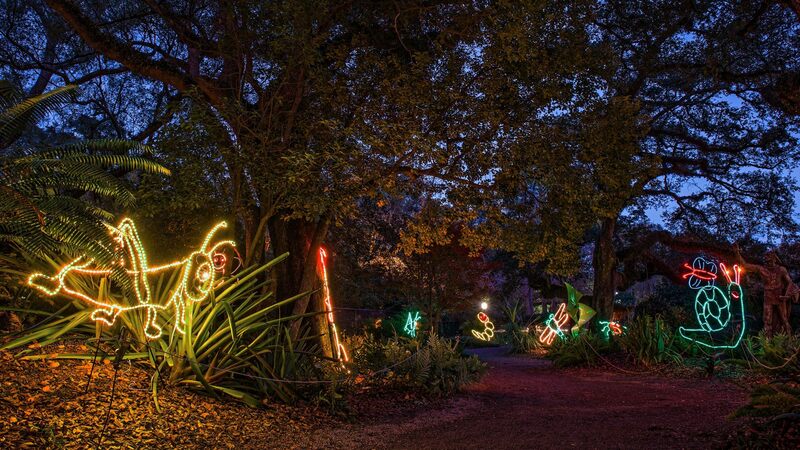 New Orleans’ most beloved holiday tradition (second only to Mr. Bingle, who also makes an appearance here) takes over 25 acres of City Park, bringing lighted displays to its gardens, oaks and lagoons. Bundle up and prepare to be enchanted.